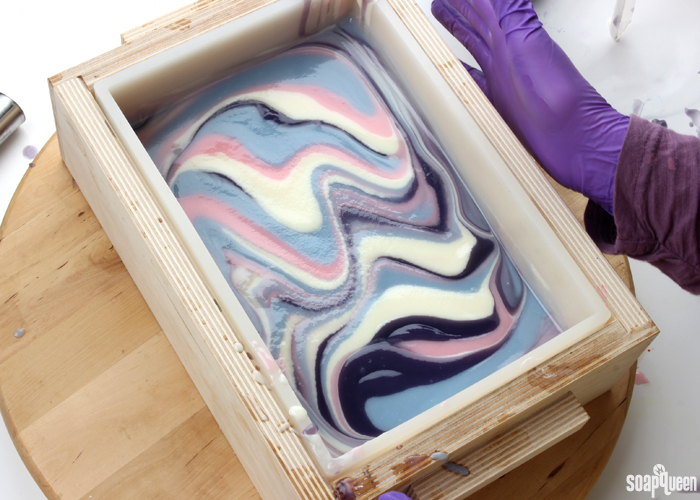 The key to soap batter that stays thin for long enough to create swirls is using plenty of “slow-moving” oils. Slow-moving oils refer to oils that do not accelerate trace. In general, slow-moving oils are liquid at room temperature. Oils that are firm at room temperature will accelerate trace in soap. Examples of oils and butters that accelerate trace are palm oil, coconut oil, all butters, palm kernel flakes, beeswax, and castor oil. 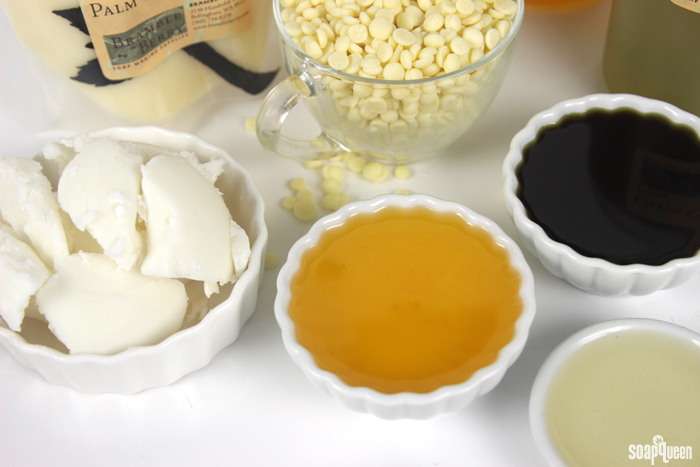 Click here to learn more about common soapmaking oils and butters. Your spin swirls look amazing. I just completed my 4th and yet another failed batch! So frustrating!!!! I can’t seem to get it finished before it thickens up and then the surface is oddly textured and hideous. I thought it would look better if I planed the surface but nope! Ugh!!!!!! Depressing. Spin swirling is a more advanced technique. 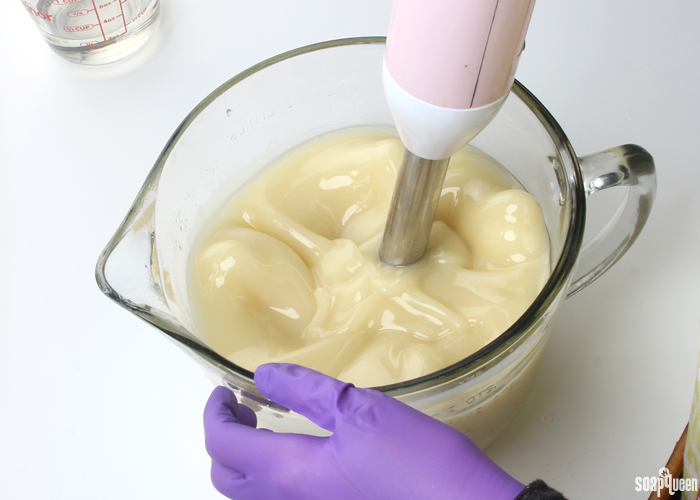 When we first tried it, we went through at least three failed batches because the soap got too thick. Keep at it, once you get the right consistency it gets a lot easier. You may try adding more liquid oils and double checking the notes on your fragrance to make sure it doesn’t accelerate. Just love this website! I have a question – just wanted to be sure that this formula will give me great moisturizing, and a little harder soap. I wanted more bubbles so I added castor oil. I still want to be sure I don’t get quick acceleration, as I want to be able to do those wonderful swirls. thank you so much – will try that! How did that formula go Andrea? Do you find that when formulating for a swirls recipe (i.e., 60% liquid oils, 40% hard), that you lose some of the desirable qualities of the final product? I generally make my soap with your recommended trio of coconut/olive/palm with castor and then a little of something else, maybe palm kernel flakes for hardness and bubbles or shea/cocoa/mango butter, etc. (I also LOVE silk tussah fiber and always add the recommended amount of sodium lactate.) This seems to make a very bubbly, lathery, silky bar. I noticed that when formulating with swirls in mind, some of those desirable qualities like bubbles and creaminess are reduced. 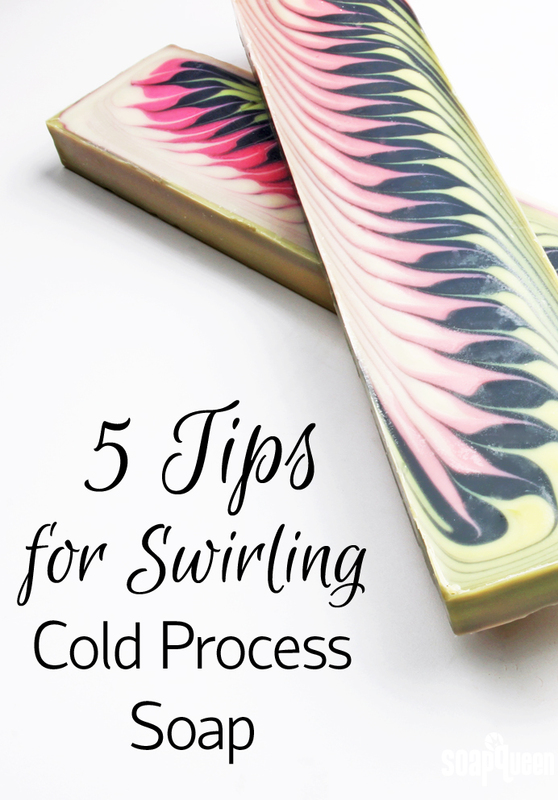 Do you find your swirly soap to be any less luxurious compared to a regular recipe? I haven’t seen a discussion about this. You can also add other ingredients to make it creamy – one of my favorites is milk. It makes the bars feel really nice and silky. Thank you for this article. I’ve only made soap to felt so far so looks did not matter and a thick trace was fine. I’m now allergic to wool and am trying my first “pretty” soap. It will be a hunting soap that is naturally coloured with no added scent. I’m using ground dandelion leaves black walnut husks, and calendula petals as my 3 colours. I am thinking of 50% Olive oil pomace, 35% coconut oil, and 15% sunflower oil. Do you have any insights on its possible success or demise? 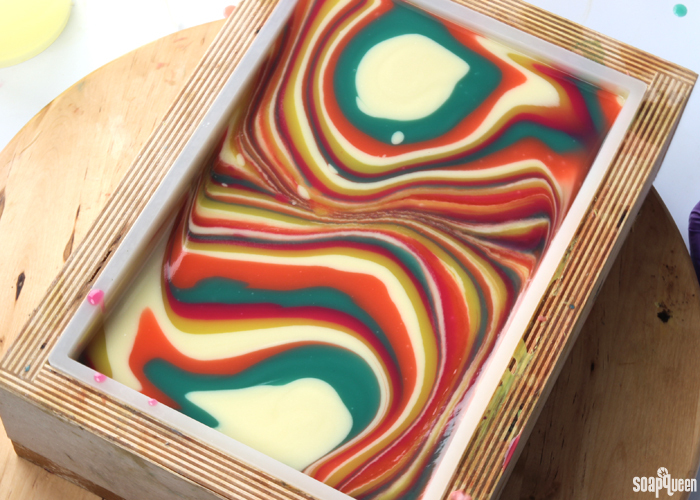 Using natural colorants in soap can be a little tricky. Most will eventually fade with time, and some will result in very little color at all. Calendula petals are a great addition to soap, and are one of the few botanicals that stay bright and don’t go brown and fade over time. I have never worked with dandelion leaves before, but my guess is they will eventually turn brown in your soap. This may also be true for black walnut husks. You may want to make a very small test batch to see how these colorants react in your soap over time. 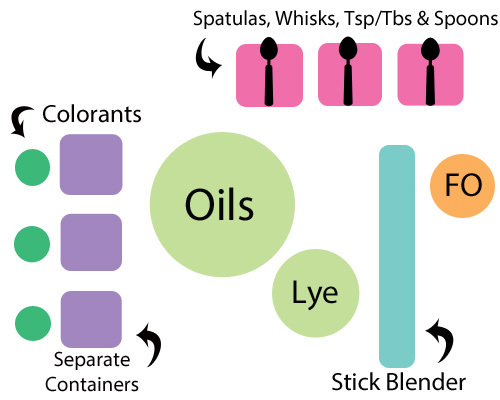 If you’re looking for more natural colorant options, you may find the blog posts below helpful! Hi, just wondering if there’s a book on slow moving EO & FO for CP soap. Blackberry Sage, Wasabi, LoveSpell, Apricot Freesia, Pineapple Cilantro, Energy, White, Tea & Ginger, Oatmeal Milk and Honey, Dark Rich Chocolate, Yuzu Cybilla, Lavender 40/42, Black Amber & Lavender, Lime essentail oil and fragrance oil, Kumquat, Rise & Shine, Pink Grapefruit, Sensuous Sandalwood, Red Apple, Champagne, Fresh Snow, Fresh Bamboo and Fresh Mango. I love the little mold. Is it sold at Brambleberry? great information here. I am an experienced HP soaper, but have only recently begun CP. My biggest two issues by far are accelerated trace. Now I know it’s probably because I love adding tallow and a little castor oil to my mixes…I may never get a super thin batter, but will keep trying different ratios. I have a separate problem though, which is sort of off topic, but has to do with soda ash. Every batch I have made so far starts off looking great, but ends up after my 48 hours cure time with soda ash. I have been insulating well. Do you think adding seran wrap and a heating pad will help ? I have read mixed reviews. Also, I just discovered that my alcohol spritzer was only 70%…do you think that made the difference? I know…lots of questions, but until I solve the ash problem, I am wasting my swirls!! Hi, Kristen. I used to have issues with soda ash and over insulating CP soap can make it get too hot and other issues like glycerin rivers will happen. Been there, done that!! If it occurs on a smooth top, you can “wash” it if with a damp wash rag. However, I learned from here (where I learned most of my good tips) that 91% or higher rubbing alcohol is very effective at preventing soda ash. I spray it on after the soap has just become slightly firm to the touch and I never have issues with soda ash. I hope this helps! p.s. CP is my preferred soap, but I also love HP soap and make a fair amount of it, too and soda ash is not an issue! thank you for the great tips…yes, finding out that my alcohol spritz has only been 70% alcohol was a big lightbulb for me! thanks Kelsey, I will definitely change to the 99% alcohol, and will re-read the warmer temp article. I have been using a sponge or rag to “wash” my CP soaps…I haven’t tossed them, just was disappointed because the swirls and things just didn’t show up as beautifully as I see online pictures. I am going to persist!! Will read more, get the right alcohol and am very appreciative of this site and the help! thx. Such great information thanks! And I agree, even if you have a “fail” it’s still gorgeous soap! Only you know that it didn’t come out as planned 🙂 That photo with the purple soap under the fragrance/essential oil section – that looks like a truck load of fragrance! You’re welcome Michael, glad you like the post! Also, that picture felt like a truckload of fragrance! It was a 12 pound batch of soap so we added 10 ounces of Electric Lemonade Cocoktail Fragrance Oil. It was weird seeing that much fragrance added at one time! My vegan recipe is notoriously fast moving, but it seems to have mostly slow moving oils…any thoughts on what is making it do that? It’s a good recipe, but I’d love to reformulate so I don’t have to plan for speed…I just don’t know what to swap out. Thanks! That’s a great recipe! It looks nice and moisturizing. A quick note first. People often use a different name on online forums and James is my first name, but I go by Eric so James is now Eric: no need to hide behind a screen name here. Now, I have a tried and true recipe that I almost never change and it has a high percent of coconut oil so it traces quickly and most of my recipes use a thick trace. However, for a thin trace, my recipe still works well if I let the lye and oils cool down to room temp. This past Saturday, I made a gorgeous faux funnel pour which required some time to work with a thin batter. Another tip I found helpful was to NOT discount water. It is my experience that not only a FO can accelerate trace but also some colorants. Especially yellow oxide ends up thicker than my other colors. When using YO for a swirl, I mix my batter to a very thin trace, add my colorant and mix some more if needed. I have noticed that with both yellow oxide and brown oxide too. 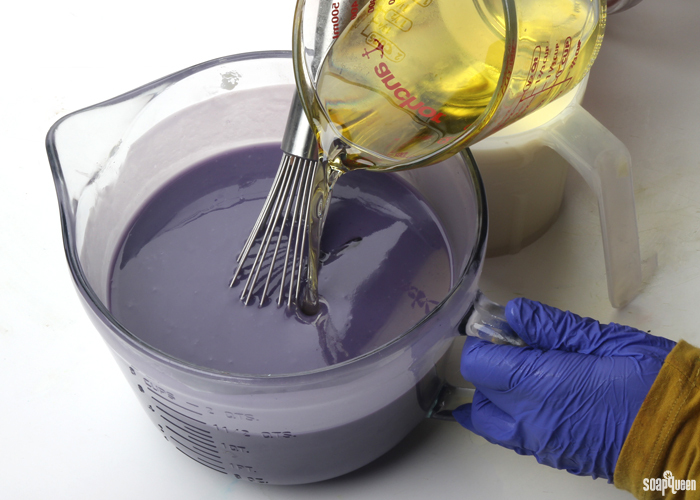 I have found it helps to mix them with more oil than other colorants need, so I mix 1 teaspoon of oxide with 2 tablespoons of oil. I also whisk them in whenever possible, and that seems to help too!